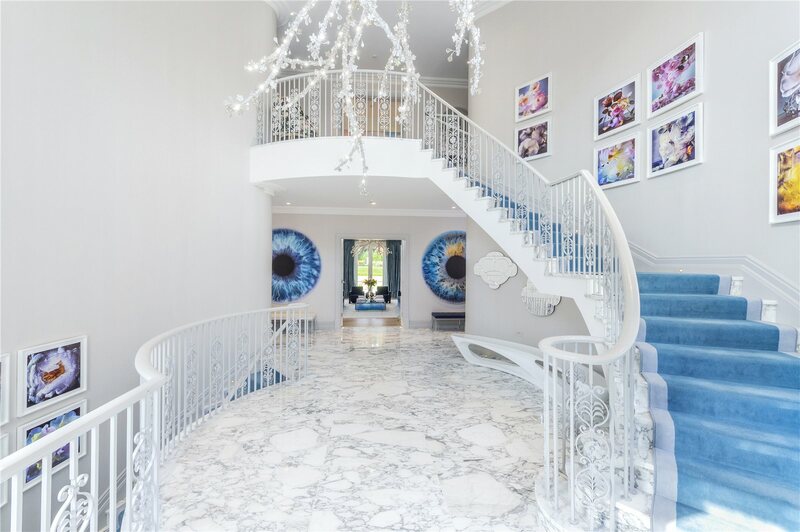 On entering Hill House you cannot fail to be impressed by the double height reception hall and a totally bespoke Swarovski crystal chandelier. This leads into a triple reception room with dining area, drawing room and library - all open plan. There is a south facing double study in the 'quiet end' of the house. At the other end of the hall, there is a luxurious open plan kitchen. Upstairs five spacious bedroom suites span the first floor. The master bedroom is particularly impressive with a huge bathroom and large dressing room. There is also a roof terrace accessed by a spiral staircase off the dressing room, which enjoys views over the tree tops of Wentworth's golf course. 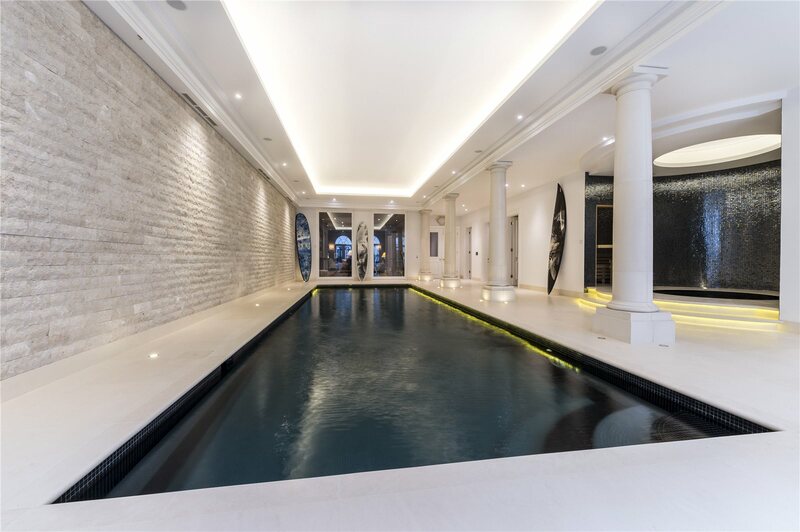 The basement has a leisure complex comprising a 12m swimming pool, spa, steam room, sauna, and his & her changing / shower rooms. There is a large conservatory housing the spacious gym. An open plan family / games room has floor to ceiling glass windows overlooking the swimming pool. There is also a one bedroom guest / staff flat with private terrace. Ceiling heights are fantastic through the whole house giving the sense of space and light airy rooms. Designed and landscaped gardens by Randle Siddeley & Associates, with full irrigation and lighting systems. Children’s adventure playground and home vegetable patch. Direct access onto the 3rd hole of the East course of Wentworth Golf Club. 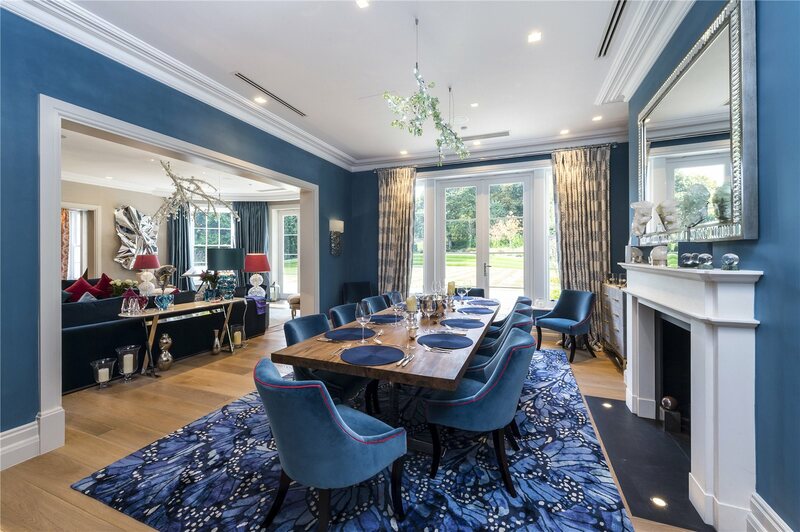 Hill House stands in a prime yet secluded location on the security patrolled estate – backing onto mature woodland and the Wentworth golf course. It is conveniently situated for the golfing enthusiast right alongside the 3rd hole of the famous East Course. 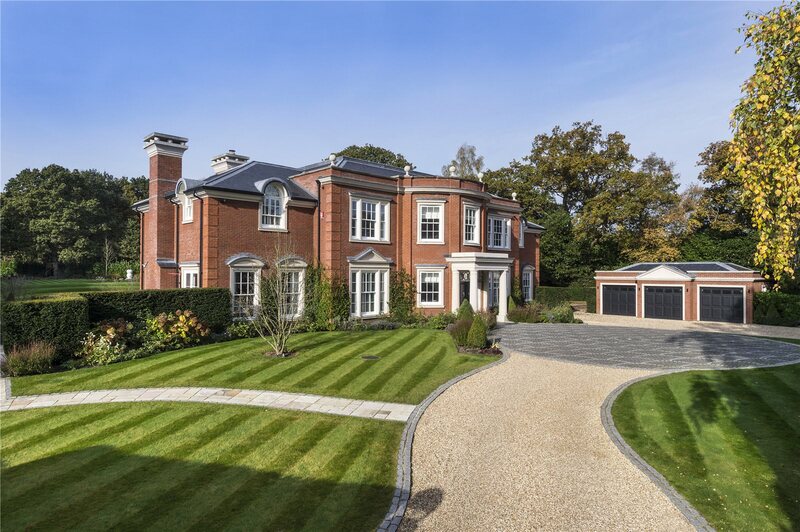 Hill House is located on the West Drive, which is arguably the most prestigious road on the ‘main island’ of the private Wentworth estate. 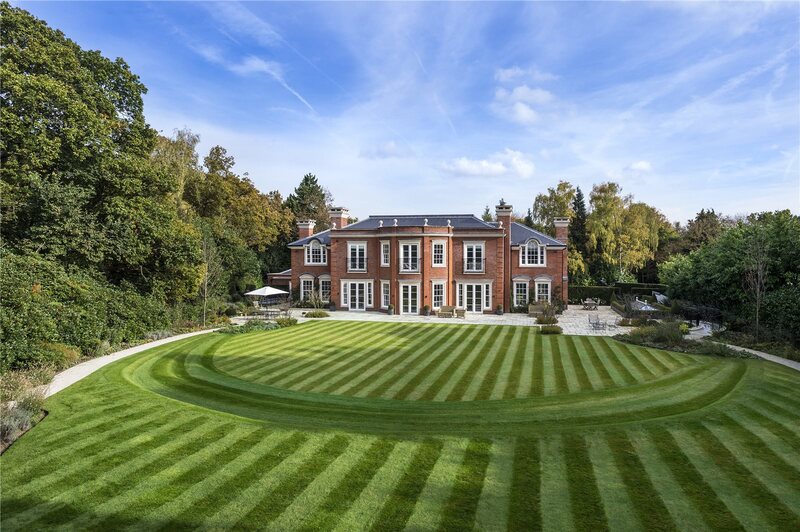 Within walking distance of the Wentworth club house, 23 miles from Central London and 13 miles from Heathrow, the tranquil Wentworth estate is probably the best country address within close proximity to London - favoured by some of the world’s most influential families. 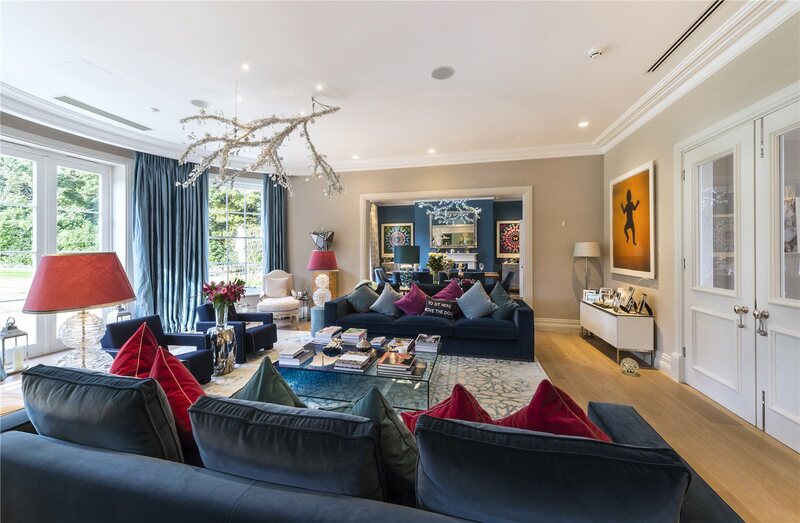 Wentworth is ideally situated close to Ascot and Windsor racecourses and polo is available at Smith’s Lawn, Windsor Great Park and the Royal County of Berkshire Polo Club at Winkfield. Virginia Water and Sunningdale offer local shopping amenities, whilst schools such as Eton College, acs Egham, St George’s Ascot and Bishopsgate are all close by.